Fleet: 3x Bréguets XIV, 6x Airco de Havilland DH9, 5x Airco de Havilland DH4, 10x Rumpler C-IV, 1x Luft-Verkehrs Gesellschaft C IV, 6x Luft-Verkehrs Gesellschaft C VI, 6x Farman F-60 Goliath, 1x Ansaldo A 300-C, 5x Blériot Spad 33. Operated by CENAC: 6x Levy-Lepen flying boats. History: under impulse of Georges Nélis and with encouragement from King Albert, Syndicat National pour l' Etude du Transport Aérien (SNETA) was formed on March 31 1919 to study the possibility of conducting flights. The initial fleet consisted out of nine former military airplanes: three ex bombers of France (Bréguets XIV), three ex bombers of the U.K. (Airco de Havilland DH9) and three ex reconnaissance planes of Germany (Rumpler C-IV). 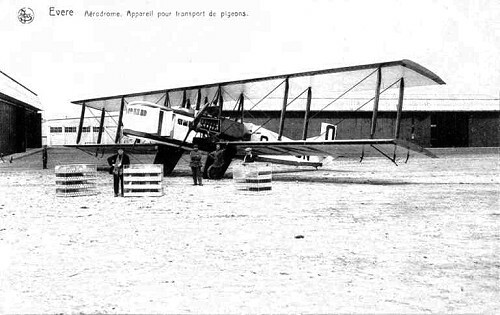 One week after its foundation the first experimental flight with two pax on board was undertaken between Brussels and Paris via London. The possibility of making flights within Belgian Congo was also investigated. For this purpose Comité d' Etude pour la Navigation Aérienne du Congo (CENAC) was formed, and from August 1919 some experimental flights were made. To warm up the Belgians, popularization flights were made from Brussels-Haren, Antwerp-Wilrijk and Spa-Sart. On May 25 1920 experimental "scheduled services" were opened between Brussels and London, shortly followed by a link to Paris and on May 2 1921 to Amsterdam. On March 1 1920, the first ever aircraft came into the Belgian register (CoA nr. 1): an ex German Air Force Fokker D VII "O-BEBE" went to Victor Simonet. On March 17 1920 this was followed by the nine strong fleet of SNETA, with Bréguet "O-BLON" the first one. From 1920 on, new pax equipment was sought and found with the purchase of six "Goliath". For the services within Belgian Congo six Levy-Lepen flying boats were acquired by CENAC. By June 1 1922 enough info was gathered and all experimental flights were suspended clearing the way to start up a real Belgian commercial operator: SABENA which came into being on May 23 1923.